An appeals court in India has cleared former chief minister of the southern state of Tamil Nadu Jayaram Jayalalitha of involvement in a corruption scandal. Ms Jayalalitha was convicted and sentenced for four years by a trial court in September. She was found guilty of amassing unaccounted-for wealth of more than $10m (£6.4m) and had to quit as the chief minister. Monday’s ruling means she can return as the head of Tamil Nadu government. Jayalalitha, a former actress, is one of India’s most controversial and colourful politicians. 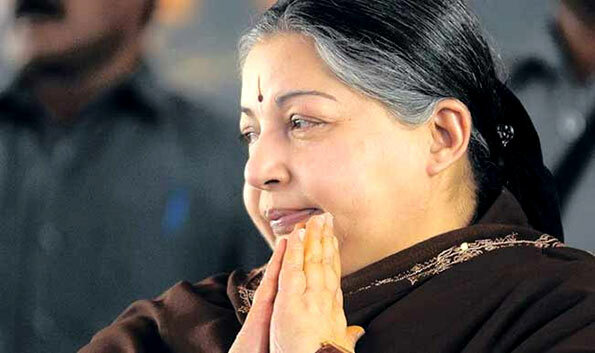 She has been central to south Indian politics for three decades. As soon as the high court in the southern state of Karnataka announced its verdict on Monday morning, Ms Jayalalitha’s supporters began celebrating outside the court in Bangalore. Her supporters outside her home in the southern city of Chennai were seen distributing sweets, shouting slogans and weeping tears of joy. The high court also cleared three of her aides who were also convicted by the trial court. The conviction last September had cut short her fourth term as the chief minister of Tamil Nadu and she had picked party leader and loyalist O Panneerselvam as her replacement. Same story in Sri Lanka, false charges against Mahinda for corruption will also be cleared. It needs time. Welcome back Ammah, Tamil Nadu needs you. You are a hero, a lady of the poor. Your programs and initiatives have uplifted the lives of many Tamil Nadu. I am sure you will return to service promptly and resume your marvellous service. You will be confronted with two thorny issues. The OISL report will be tabled in UNHRC in September. You will be confronted with difficult leaders in the isle of Sri Lanka. The second issue is Kachchativu; this is causing immense harm to the poor fisherfolk of Tamil Nadu. Mr Modi failed to hit it off with the new President in Sri Lanka. The ousted President was a bosom pal of Mr Modi. I am sure you will use this fractured relationship between the leaders to the benefit of the people of Tamil Nadu. Corrupt woman got released through corruption it seems. In tamilnadu, anything is possible with money. Is it your contention that this once filmstar buxom lady should be allowed to exert her energy to win back Kachchativu for the fishermen of Tamil Nadu to carry out their nefarious activities like poaching in our territorial waters, smuggling of arms, smuggling of contraband and smuggling of illegal emigrants etc all to the detriment of our motherland . The return of Kachchativu to India will result in the alteration of maritime boundaries. This will provide India with wider authority over larger areas of the sea. Such authority will precipitate enforcement of International Maritime Laws by India on its citizens conducting fishery in its oceans. I do not condone “nefarious activities like poaching in our territorial waters, smuggling of arms, smuggling of contraband and smuggling of illegal emigrants etc………..”. Lawbreakers should face the consequences of their actions. The World also has many mechanisms to deal with those responsible for enforcement of laws but are failing to do so. Primarily, what is required is to keep emotion away from law enforcement and proceed with due process. The media could play a significant role in law enforcement by adopting a non-emotive approach to reporting criminality. If Indian navy cannot do their job without having Kachchativu island under their control, that argument is like saying, it is easier for the Indian Navy to do their job if they have whole Sri Lanka under their control. Of course why not? Once they get Kachchativu, then they will ask for Kaits island using the same foolish logic. I think those who ask for the Kachchativu island are the ones who are overwhelmed by emotions rather than logic. This is much easier than having emotions, just use logic. Why cannot Indian navy protect their borders without Kachchativu? Did the Indian navy ever complained about it? No. That means there is no logical need to have territorial hand overs. Just do the job by both sides and that will be the best for both parties.